A page dedicated to one of the oldest and best car companies ever! Here's a little something for all those who hate skodas! What's the best way to rumble someone who knows nothing about cars? Wait until they crack a joke about Skodas. Whereas once Skodas were a byword for automotive catastrophe, these days buying a Skoda marks its driver down as Someone Who Knows About Cars. What goes around comes around, and Skodas are now amongst the most sought after used car buys around. 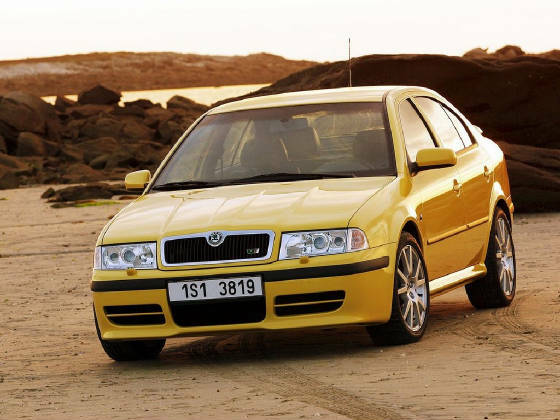 The car that firmly put the Czech concern on the map is the Octavia. Despite the 'three-box'body, the Octavia is in fact a five-door hatchback. An estate version was subsequently launched, and the Octavias were so far ahead of the competition that the only thing they had to fear were VW group siblings such as the SEAT Toledo and VW Bora.